Should You Donate Paintings to Charity Events? A gazillion years ago, when I was a puppy dog DJ learning the ropes in the radio business, a wise mentor once told me, "Eric, the cornerstone of success is found by playing an active role in the community. The greatest radio stations are those that are the most involved." At the time, it seemed like lame advice. How could that be the cornerstone of success? Yet his words echoed in my head, and as my career moved forward and my brain started to mature, I realized the power of his words. And his advice has served me well. Just yesterday an artist was whining to me on the telephone. "Everyone keeps asking me to do charity events," he said. "I'd be better off just sending a check -- at least I can write that off. I can't write off donated paintings. I've decided these events are a complete waste of time." 1. Is this cause something I care enough about to donate my efforts? For me, it doesn't have to be a charity I'm passionate about, but I won't donate to just anything. I don't want my energy to go toward something contrary to my beliefs. 2. What will be the benefit to my career? Though this sounds selfish, it's also practical. Will I just blend in, or will I stand out? If my painting is one of a hundred others in a silent auction and I'm not highlighted or acknowledged, then I'm less likely to do it. If there's a strong chance I'll receive little or no publicity, I'll often avoid it. If, on the other hand, I can be the star attraction and know I'll be asked to say a few words or someone will talk about me and my artwork on stage, or if there's a chance of local publicity, I'll usually do the event. I also want to be part of photo opportunities with the painting when possible. No, I'm not being a snob. If, however, the majority of people attending are unlikely to ever buy a painting or are unable to afford art, then it might not be worth my time to participate. Think of your donation as an expenditure on advertising. You wouldn't advertise to people who don't or who cannot buy art. The desired effect is for those in attendance to say, "That was a great painting. I'd like to own one of his works." Your donation can plant that seed. 4. Can I get a list? Always ask if you can get the list of those who attended (or, better yet, the invitation list) in exchange for your donation, since you can't deduct art donations. Some events will give the list if you tell them exactly how you intend to use it. I usually say, "I'll send them a letter or card, pre-approved by you, thanking them for attending the event and telling them that if they enjoyed my artwork, here's how they can find my website or sign up for my e-mail updates." If the event organizers won't give you a list, ask if they would mind if you put a bowl out for a drawing to win a painting. That's a smart way to gather names. 5. Can I get my materials distributed? I usually ask if it would be appropriate to put my brochures out next to the display of my painting. Can't hurt to get your postcard into their pockets. 6. Will the exposure build frequency? 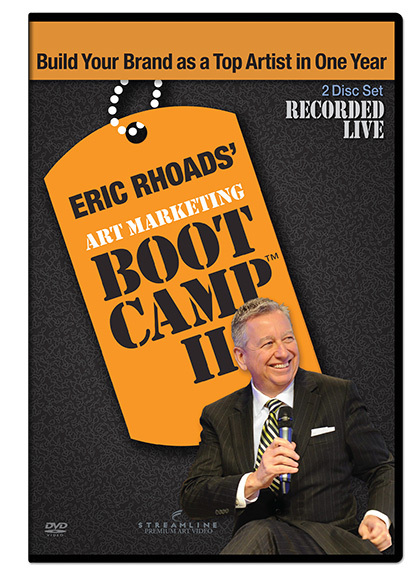 In my Art Marketing Boot Camp™, I stress the critical importance of repetition. The more frequency you have, the more people get to know your brand. If the VIPs of your community see you at every major fundraiser and you're the featured artist, your importance is elevated and your brand is reinforced. If you can make it appear that owning your artwork is important, that reinforcement will help create interest. 7. Will it build my local brand? There is an old adage that the farther away a consultant is from the client, the higher the consultant's price. The same is somewhat true for an artist. A collector in Indianapolis probably thinks a painting they buy from a Chicago gallery is better. A Chicago collector probably thinks a painting from a New York gallery is better. A New York collector may think a painting from Amsterdam or Paris is better. So sometimes being local does have a downside. But there's always room for one or two local icons. Becoming known as that iconic local painter is a great way to sell a lot of artwork in your area. There are dozens of things you can do to build your visibility in the local community -- being involved in boards, working at events, and just pitching in at every opportunity will show people you care. It will also help you know the movers and shakers who are often your potential customers. Though your first intent should be community involvement because you want to help, there are always side benefits that can be good for your business. As you may or may not know, I've spent much of my career in the radio broadcasting business, and my involvement in creating change -- sitting on boards, helping raise money, and doing things for the community -- has helped my business as well, and given me a great deal of personal satisfaction from knowing I've made a difference. The same has been true in the art world, where I've made a point of contributing my time and trying to create things to make the art world better for everyone involved. No one says, "I wish I'd worked harder and made more money" on their deathbed. Though community involvement is good for business, it also affords you the chance to look back and see that you've made a difference in the lives of others. It took me a long time to understand that community is the cornerstone of success -- with success defined as a life of generosity to those around you. PS: Ever heard the expression "The squeaky wheel gets the grease"? After writing these art marketing thoughts for a few years, I've had people ask me for a book or a seminar, and I responded that I simply didn't have the time because I have a business to run. 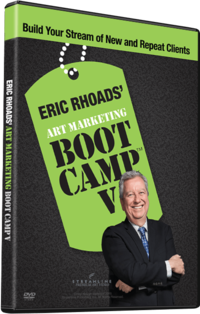 But the squeaking continued, and I decided to spend several weeks preparing an Art Marketing Boot Camp™, which I presented for about 4 and 1/2 hours during last year's Plein Air Convention. We videotaped all those marketing sessions, but I ran out of time, so I went into the studio and we videotaped the rest of the material I couldn't get to onstage. Though that video isn't available, you can sign up to receive a notification when it is released in just a few weeks. Just visit www.streamlineartvideo.com.